Home › Dall' Emilia Romagna › Green Tourism a Cervia: “Italy shows tourism the green card” così scrive Travel Mole la più grande comunity online di turismo e viaggi. 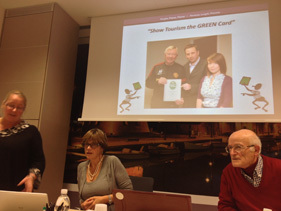 Green Tourism a Cervia: “Italy shows tourism the green card” così scrive Travel Mole la più grande comunity online di turismo e viaggi. The pilot scheme presented in co-operation with local hotel association ASCOM is expected to attract an initial group of accommodation providers and other tourism businesses to wave the green card in Italy. The Italy launch will enable local tourism businesses to save money and have their offers audited and certified for the rapidly-expanding global green tourism market. The pilot project will enable local tourism businesses to have all the benefits of the programme for a fee-free period. It is expected that Green Tourism Italy will be available to other Italian destinations within the course of the next months.